Going hand in hand with our reactive locksmith service our team includes full carpentry support to quickly fix break in damage and re-secure your building. Offering a full 24 hour emergency locksmith service for private customers across the south east and commercial clients nationwide, we often arrive to find serious damage to doors, windows and frames that prevents the property being secured. All our locksmiths are skilled in, or backed up by a trained carpenter who can quickly make good frames and replace doors with like for like or a higher security model. We are full members of the Master Locksmiths Association, complying with their code of conduct as well as health and safety and building codes legislation. Employing only fully qualified and experienced locksmiths and security installers we guarantee every customer exceptional workmanship and customer service whatever the requirement. 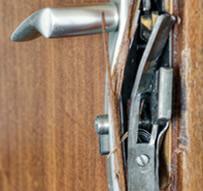 We can also offer you consultative advice on security enhancements that could prevent a break in happening again. We know physical security inside and out, manufacturing our own high security timber and steel reinforced security doors, but we also employ skilled CCTV, alarm and access control technicians to create a complete security system package for you.